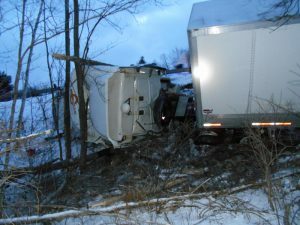 A single tractor trailer left the highway and took out several trees before it landed at the bottom of a ravine. Responding units were informed that there was no entrapment. Crews accessed the vehicle by using a rope attached to the guide rail. The vehicle was secured and the driver was checked by Lake Harmony Rescue Squad. Units were on scene for 2 hours awaiting the recovery team.